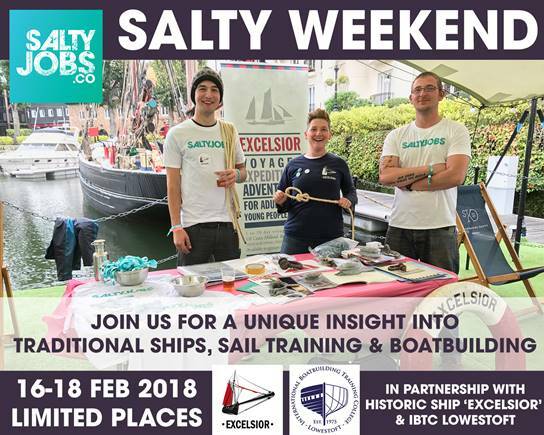 Our friends at SaltyJobs have just launched their first ever Salty Weekend event. Come and join the crew onboard traditional sail training vessel Excelsior for a weekend in February. Talks & workshops giving you a behind-the-scenes insight into traditional boats, sail training and boatbuilding. In partnership with The Excelsior Trust & IBTC Lowestoft. Hosted at The Excelsior Yard in Lowestoft. Food & accommodation onboard included. 6 places only. 16-18th February 2018.